Located In (Or That Service) Our Wonderful Historic Rivertown City! 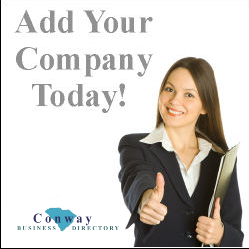 Get Your Conway Company Noticed! Add Your Listing Today! part of The Conway SC Network! This means more options for you and that your Conway Business will be added to multiple Conway websites and possibly Grand Strand area websites too!